ARGs are a topic that hasn’t been discussed much in sci-fi, so I’ve used my own experience playing games like Ingress and Pokemon Go to construct the story, which I hope will give it that feeling of authenticity that so many stories about gaming lack. 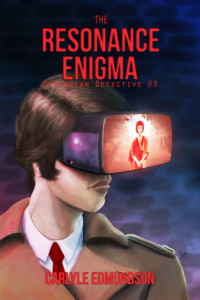 Virtual reality, location-based gaming, and artificial intelligence come together to create a mystery that I think even those who aren’t gamers will enjoy. Thanks for looking, and I hope you’ll give the book a chance. The previous two books, The Arcology and Eidolon, are already available if you want a headstart!